This tradition has been performed in San Miguel since the 18th century. Originally the children approached the doors of the wealthy Spaniards. 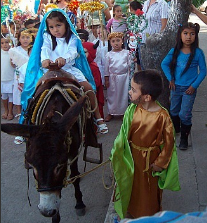 Though denied entrance to the “inn”, the children did receive fruit, sweets and small gifts as San Miguel’s wealthiest competed between the various families to see who gave the best posada treats. In exchange, San Miguel’s poorest children received holiday treats otherwise unavailable to them. Today, sometimes, a nativity set is carried door to door instead of using child actors. Through song, the Holy Couple eventually finds an open door and a welcome, and everyone is offered food and a hot fruit drink. Piñatas get broken representing the destruction of the seven deadly sins of wrath, greed, sloth, pride, lust, envy, and gluttony while emerging candy is then gobbled. It is a moving way to enjoy the spirit of the season. Originally posadas were introduced in Mexico by the Augustine clergy to replace the indigenous celebrations for the god of war, Huitzilopochtli, that occurred over the same nine days. During the Spanish conquest the Aztecs had also used these dates to honor the sun and the god, Quetzalcoatl. Celebrations that included human sacrifice to the moon were replaced by posadas.